Yesterday was dark and gloomy, with low clouds and heavy showers. The world was dark grey. Then just before it set the sun shone out below the clouds, lighting the trees and fields. The sudden sensation of colour was astonishing. The world lit up. At first there was no rainbow but I suspected one would come and hurried outside to watch. And come it did, a perfect bow curving over the trees. In fact it was a double rainbow - I could just see a second one. Rain was still falling - streaks of it can be seen on some of my photographs. Knowing the rainbow probably wouldn't last long as I'd just grabbed my camera - Sony NEX 7 with 16-50 zoom lens - and headed out the door. 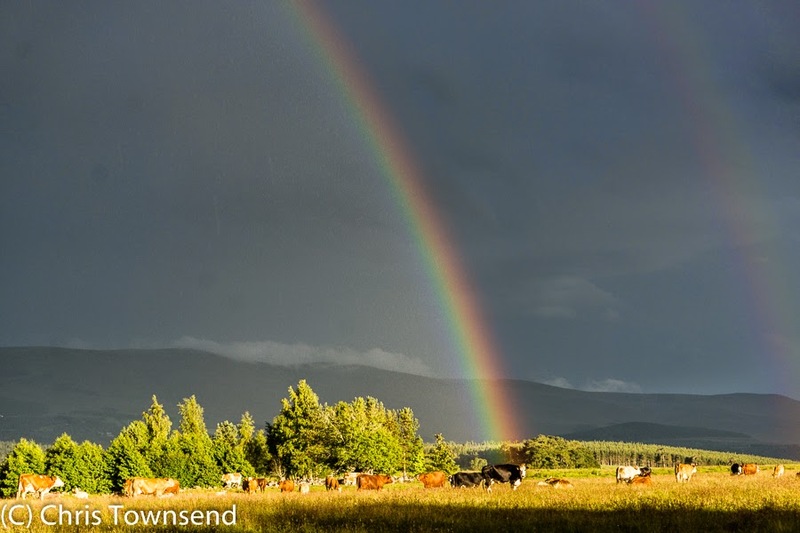 I wanted to be far enough away from the woods to see the whole rainbow. 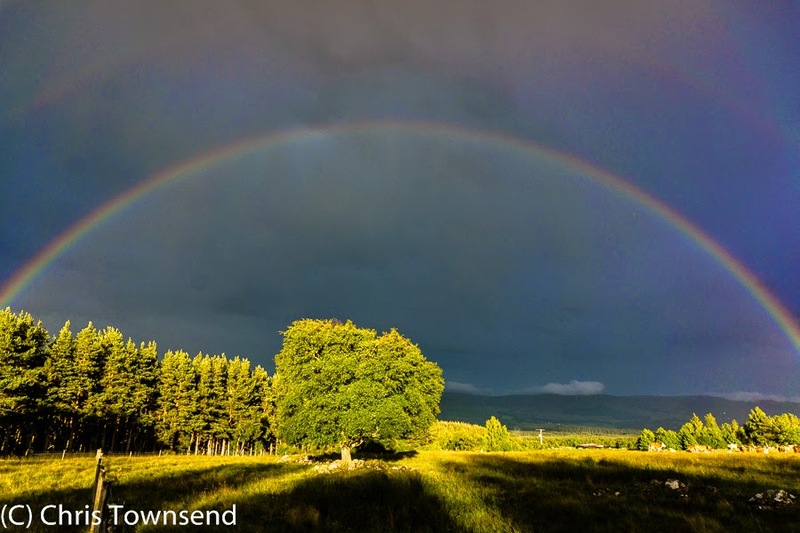 Out in a meadow I found a near perfect scene with long dark shadows from trees behind me and a solitary birch almost under the centre of the rainbow that caught the sunlight beautifully. I could have done without the power line pole but there was no way to block it and still have a good composition (some photographers would remove it in post-processing but I want my photos to show what I actually saw). To the right of the top photo a herd of cows can just be seen. I zoomed in on these and took the following picture. For those interested in the technical details all the photos were taken at 1/125 at F8, ISO 200. Only the focal length of the lens was changed. I took raw files and processed them in Lightroom.